Before start deep discussion on the operator. First of all, I would like to do the discussion on three terms which are operator, operand, and operation. OK, anyone tells me what is it? No, OK fine, I will explain to you. Start with the term operation, the operation is nothing it is just a process. Understand the meaning of this line, no, it's OK, No issue. Try to understand operation with the lock and a key example I want to open the lock using a key, in this line what is the process is going to happen that is opening a lock right. The task or action which you performed is called operation. Now, anybody can tell me what is operand from the lock and key example, of course, lock and key are operands, quantity or thing on which operation is going to be performed is called operand. Now, come to our main term i.e. the operator when a person derives or operate a machine or equipment or device is called operator, simple is that in mathematics '+' is the operator which perform the addition operation on the operand. 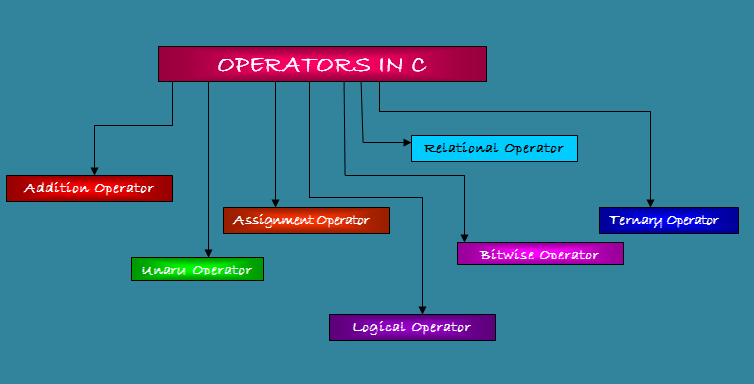 Operator in the C programming language is a symbol which tells the compiler which operation is going to be performed or which operation is to be performed on the operand. In the above example, g and f are operands, '+' is operator and addition is an operation. The arithmetic operator performs the mathematical operations like addition, subtraction, multiplication, division and modulus operation. 2. When 'a' is float data type and 'b' is an int data type. 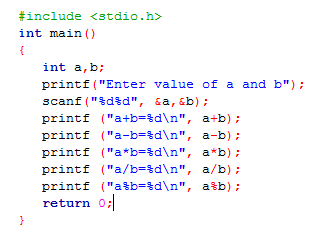 An error occurs after compilation of the above program because modulus operator is not applicable when both the operands are of the float data type. An error occurs after compilation of the above program because modulus operator is only worked on an integer data type values. If you want to print two digits after decimal point then instead of writing %f you will write %0.2f and now only two most significant bits are printed after a decimal point or if you want to print four digits after decimal point then you can write %0.4f. The unary operator operates on a single operand that means it only needs one variable to perform an operation. Unary minus: Symbol of unary minus is denoted as (-). Unary minus is different from a subtraction operator because subtraction operator needs two operands to operate but unary minus needs only one operand to operate. Unary minus is used to make positive value negative or vice versa. Increment operator: Increment operator is used to incrementing the value of operand by one. Increment operator is denoted by the symbol (++). Post-increment: This increment first used the value then increases the value of an operand. First of all value of x is printed i.e. x=10 then the value of x is incremented by one i.e x++=11. Pre-increment: In pre-increment, the first value of the operand is incremented by one then it is used further. Firstly, the value of z is incremented by one i.e. ++z=35 then the value of z is printed. Decrement operator: Decrement operator is used to decrementing the value of operand by one. Decrement operator is denoted by the symbol (--). Post-decrement: This decrement first used the value then decreases the value of an operand by one. Firstly, the value of w is printed i.e w= 45 then it is decreased by one i.e. w = 44. Pre-decrement: In pre-decrement, the first value of the operand is decremented by one then it is used further. First of all, the value of w is decremented by one i.e. w=44 then it is printed. Logical Not operator: Logical Not operator is denoted as (!) and it reverses the logical state of the operand. sizeof ( ) operator: sizeof operator is used to calculating the size of the operand. After the run of "sizeof" instruction compiler tells the size of integer 'a' i.e 4 bytes. Similarly, if you want to find out the size of float, double, char etc. you can write "sizeof" command before operand. The assignment operator is used to assign a value to an operand. Associativity of the assignment operator is from right to left i.e. value give on the right-hand side of an operator is assigned to the variable on the left. a = a+15 can be written as a +=15. This operator first adds the 15 to the value of 'a' and then transfer to operand 'a'. Similarly, a = a-15 can be written as a-=15. a = a/15, a = a*15 and a = a%15 can be written as a/=15, a*=15 and a%=15. Relational operator is used to checks the relation between two variable like a comparison, greater than, less than etc. If that relation or expression is true then it gives/returns true value i.e. 1 otherwise zero/ false value. == equal to operator checks the value of two variables if the value of operands is equal then it returns true value i.e. one otherwise false i.e. zero. != not equal to operator is used to checks the value of the given operand is equal or not, if it is equal it returns false value else true value i.e. 1. > greater than operator checks the value of the first operand is greater than the second operand if it is true then it return 1 else it returns 0. < less than operator checks the value of the first operand is less than the second operand if yes then it returns 1 else it returns zero. <= less than equal to operator checks the value of the first operand is less than or equal to the second operand if yes then it returns 1 otherwise it returns zero. >= greater than equal to operator checks the value of the first operand is greater than or equal to the second operand if yes then it returns 1 else it returns zero. C program to demonstrate the working of the relational operators. Logical AND operator: When both conditions are true (any non-zero value is considered as true value) then the output is true if any single condition is false then the output is false. Logical AND operator is denoted by the symbol (&&). First of all, the compiler checks the value of 'b' which is greater than 20 or not? If it's not, then compiler not move to check next condition and gives false output. If the value of 'b' is greater than 20 then the compiler will check the condition i.e. increase the value of 'b' by one. Because 'b > 20' and ' b++' is true then output will be true. Logical OR operator: Any single condition is true (any non-zero value) then the output will be true. Logical OR operator is denoted as (||). In the above expression, first checks the condition (w > 21) or not, the value of the operand w is 20 and the condition w > 21 becomes false because 20 is not greater than 21. Now the compiler checks the next condition mention in the expression i.e. w==20 and this condition is true. So, the output of the expression is true. 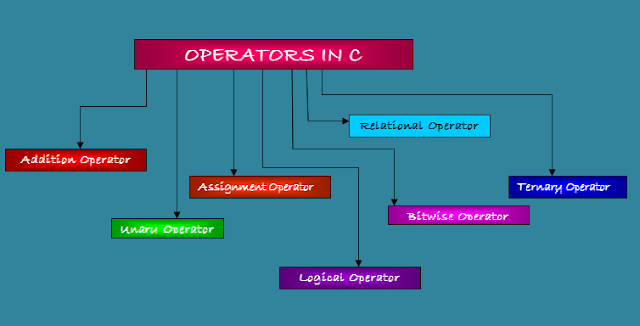 Logical NOT operator: This operator is a unary operator which reverses the value i.e. if the value is true then this operator make the value false or vice-versa. A symbol used for NOT operator is (!). Ternary means three objects whenever any operator operates on three operands are known as Ternary operator. 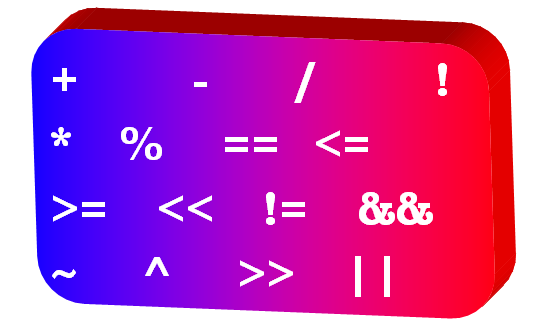 The ternary operator is a shorter version of the if-else statement. 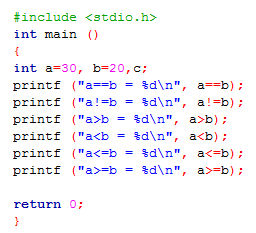 It is also known as a conditional operator. The above statement says that when condition-1 is true then the statement-2 is operated else statement-3 is operated. In the above program, when condition (a > =b) is evaluated to true then the output is k=c else k= d.
Left Shift Operator (<<): This operator shifts the bits of a number to the left and put zero to the right side. 0000 1111 << 2 will shift the two bits of a number to the left then the output will be 0011 1100. Try to understand it using one more example 1111 0011<< 2 and the output is 1100 1100. 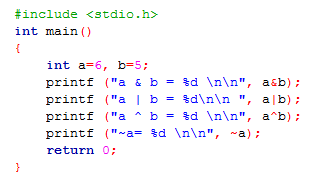 Right Shift Operator (>>): This operator shifts the bits of a number to the right and put zero to left as a result. 0000 1111 >>2 will shift the two bits of a number to the right then the output will be 0011 1100.